Hi friends! I hope you had a great weekend! We had a fun one! There's a giant pumpkin festival every year in our town and we attend each year. It was just as great (if not better) this year and the kids had a great time! This might seem backwards but I'm gonna start with my goodbye. It's with a VERY heavy heart that I'm stepping down from the Lawnscaping Design Team. If you've been a follower for a while, you know that I've been having some health issues and I need to take some time to work on that. I've really tried to stay on all my teams but I haven't been able to give everyone my best. I'm SO sad to be leaving the AMAZING Lawnscaping team. Each of these women is so kind, talented, loving, and caring. I, honestly, could not have asked for a better support system. They are all now my friends and I'm so lucky to have them! And I have to extend a HUGE thank you to Laurel and Lynnette for asking me to be on this team when it began and believing in my talent every step of the way. Ok, enough about me! On to the Lawnscaping Challenge! 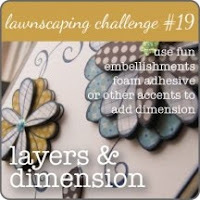 The theme for this challenge is to ADD Dimension to your project! You can use foam adhesives or embellishments to add dimension. The sponsor is Simon Says Stamp which is just an AMAZING store! The winner of the challenge will receive a $25 gift certificate! Here's my first card for the challenge where I managed to accidentally GLUE my tree layers down instead of popping them. (Proof that I might need a little break.) Though the embossed and glossy papers on this card do give it dimension. I used Lawn Fawn's Critters in the Forest for this card along with some Imaginisce paper. And now for the card I did right! 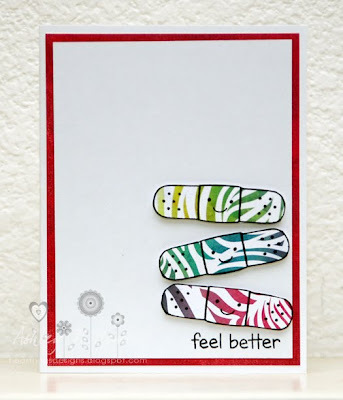 ;) I used some foam tape to pop all these bandaids to give this card lift! This card uses Lawn Fawn On the Mend and some Basic Grey Lauderdale paper. I am also linking this up to the Link Up for Pink linking party where they are hosting an amazing event for breast cancer! Both cards are adorable, I love the first with that paper, it is one of my faves right now! Ashley, please take care of yourself!! :) Hugs! What a cute second card you made. I love it! You know I will miss you on the team, but really want you concentrate on your health right now!!! That is what is most important! BIG HUGS my friend! Hope you get better... Take care of yourself. Thank you for linking another card with us. really cute cards....hope you feel better!!!!!! Darling darling card....those bandages are just tooo cute. Take care of yourself and you have done a wonderful job as part of their design team. Wish you the best of luck. This is so...so...so C-U-T-E!! Love it. I love the get well card with the bandaids. So cute! Both cards are fablous - just love the Feel better card!! 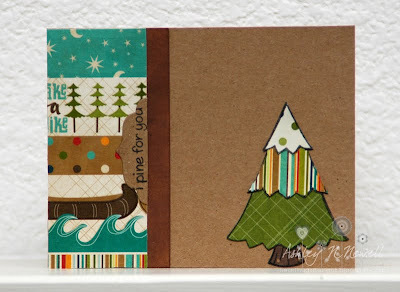 Two wonderful cards but those little bandaids I spied over at LUFP and had to have a closer look. So cute. I wanted to let you know you are a LUFP winner. I will be emailing you later today with the details... Check out my blog in a couple hours to see what you won.